Bill Cosby and Wikipedia: Legal intimidation or fear? There have now been nearly 50 women who have publicly accused venerable comedian Bill Cosby of inappropriate sexual conduct throughout his entire career, but what will you find on his public Wikipedia page? In his introductory Wikipedia paragraph, visitors will see nothing but the glowing commendations Cosby has earned over the years. Only in the deeply buried sections of his online encyclopedia entry will anyone eventually find a brief description of the ongoing sexual allegations and lawsuits. Visitors to the page are also greeted with a warning that "the neutrality of this article's introduction is disputed". Bill Cosby has been the subject of at least three independent police investigations spanning 15 years, as well as civil lawsuits that include six named victims and a total of more than a dozen women including Jane Doe witnesses. In addition to that, a total of more than 40 women have come forward accusing Cosby of inappropriate conduct, ranging from dubious former felons to high-profile Hollywood executives. Yet his Wikipedia page spends only four paragraphs talking about the myriad allegations, compared to more than 40 other paragraphs discussing his achievements in TV, film, and academia. Anyone attempting to create a specific Wikipedia article about the Bill Cosby sexual assault allegations will be rebuffed by the website for creating an article that only exists to defame or damage the reputation of someone -- no matter how many New York Times or Associated Press references accompany the article. And yet, many other former celebrities have their own allegations detailed in specific Wikipedia pages, like Jimmy Savile, Kobe Bryant, and Jerry Sandusky. Any time someone attempts to further expose the sexual assault allegations to Bill Cosby's Wikipedia page -- which may arguably define the comedian's overall legacy -- they are questioned. Even earlier this month, an attempt to add additional sexual assault allegations to Cosby's Wikipedia page were removed, with the following comment: "We don't know for certain, and we can't express that in Wikipedia's voice as if it was a fact". The Bill Cosby Wikipedia page has been placed into "semi-protected mode", meaning that only verified Wikipedia users may attempt to edit the page. And even then, anyone attempting to add negative information about the comedian is thrown against the wall. Even though there are more allegations of inappropriate conduct for Cosby than nearly any other American performer in history, the revision history of Cosby's Wikipedia page history includes the assertion that it "was agreed to not be up to the level of importance for the intro," meaning the allegations will not be incorporated into the introductory section of Cosby's Wikipedia page. Given that Wikipedia is supposed to be the most open and transparent source of information on the Internet, it makes one wonder why Cosby continues to be so insulated. Is it fear of ramification from Cosby's legal team? Is it because of the power of Cosby loyalists who do not want to see his name tarnished? 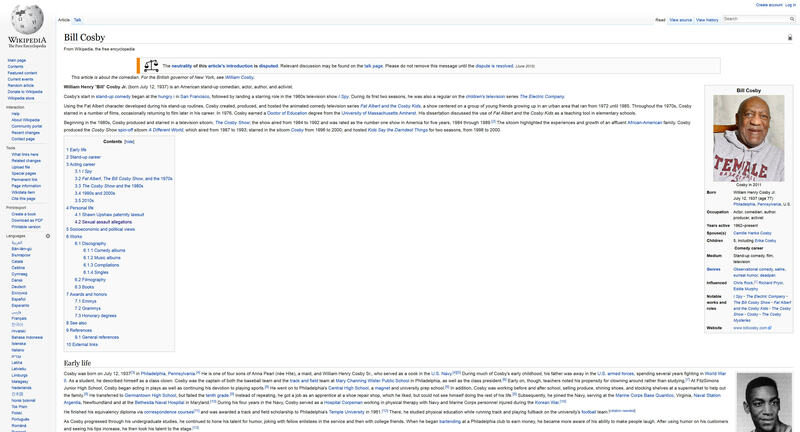 Whatever the cause, it seems like an injustice for a source as powerful as Wikipedia to appear to be willfully ignorant of the continued allegations against such a powerful and venerated pop culture icon. Meanwhile, Cosby currently faces three ongoing lawsuits: a class-action suit from three women who claim Cosby unfairly branded them as "liars" for speaking out, a separate lawsuit from former model Janice Dickinson over similar claims, and a sexual battery lawsuit from yet another victim who alleges Cosby sexually assaulted her at the age of 15. Isn't that enough to deserve at least one sentence in a celebrity Wikipedia introductory paragraph? Apparently not. P.S. Bill Cosby has denied any wrongdoing and has never been criminally charged.